Despite the trials and tribulations of the last 18 months, boat dealer Anthony Aisquith is feeling somewhat upbeat about his prospects in the months ahead. For one thing, the rains have come to the Southeast, and the lakes in Alabama and Georgia where his Singleton Marine Group operates six dealer locations are back to normal levels. Aisquith also is capitalizing on the times and generating some good business by selling repossessed boats for local banks. Still, there are issues. Like most dealers, he&apos;s still dealing with tighter floorplan credit lines. That, plus the uncertainty of where the economy is headed long-term, has forced him to be cautious about inventorying boats. For that reason, he is nothing short of ecstatic about Regal Marine Industries&apos; opening a factory showroom at its sprawling Orlando, Fla., manufacturing facility. "It&apos;s the best sales tool I&apos;ve ever seen a manufacturer offer a dealer," says Aisquith, who added the Regal line of runabouts and cruisers to his product offerings last December. Regal&apos;s goal is simple, says company president Duane Kuck. "In today&apos;s new economy, dealers don&apos;t stock as broad or as deeply as they used to, so this is a way to supplement that, but not replace it," says Kuck. Regal&apos;s product line ranges from 19 to 52 feet, and all of its models are neatly displayed in the new showroom, which adjoins its administrative office building. While Regal dealers typically stock smaller models, many don&apos;t inventory the larger cruisers, especially the sportyachts from 40 to 52 feet. And none of Regal&apos;s dealers stock or display the company&apos;s entire line. So the showroom is designed to help dealers sell product they don&apos;t have on site. "The big advantage here is that we can have every single model we build on display," says Kuck. "That&apos;s not practical for a dealer, especially in today&apos;s economy." That&apos;s not to say Regal dealers aren&apos;t expected to inventory product. Minimum stocking requirements still apply, says vice president of sales and marketing Duffy Stenger, "although I wouldn&apos;t say we have a lot of tough requirements, given the realities of the market." Nonetheless, given floorplan conditions and all that dealers have gone through in the last few years trying to reduce inventory levels, the showroom is viewed as a logical tool to help them generate sales and reduce operating costs. "In today&apos;s market we want our dealers to inventory and sell what&apos;s going to turn the best in the market," says Stenger. With Regal&apos;s proximity to Orlando International Airport and Orlando&apos;s popularity as a tourist destination, Stenger and Kuck say potential boat buyers can easily fly in not only to see finished boats in the showroom, but also to see how they&apos;re built. In some cases, dealers might pay those for the flights. In others, the buyers themselves might foot the bill. Regal has partnered with AirTran Airways and a nearby Orlando hotel to offer special rates to dealers and/or customers who want to visit the facility. "We&apos;re in the vacation capital of the world, so many of our customers visit the showroom while they&apos;re already here," Kuck says. As popular as it appears to be with dealers, there&apos;s more to the new showroom than simply helping them sell product they don&apos;t stock. It&apos;s also part of Regal&apos;s overall mission to better manage its inventory and reduce pipeline costs. One way to do that, Stenger says, is to presell more boats and deliver them directly from the factory to the end user through the local Regal dealer. In fact, Regal has been doing this for several years on its larger models with good success, says Stenger. The idea originated from a focus group Regal conducted several years ago when it was developing its 52-foot Sport Coupe. "It was a pretty intense two-day event where we had a lot of discussion," Stenger says. At the end of the session, Stenger asked focus group members if any of them might be interested in purchasing a 52. Given that the boat was in preproduction, he was able to offer a considerable discount. To Stenger&apos;s surprise, four couples responded by putting down $10,000 deposits, which were refundable if the buyers didn&apos;t like the end product. "We didn&apos;t even have pricing or anything," Stenger says. "We just had some concept drawings." From there, the company developed a preproduction sales strategy for its larger boats in which Regal basically builds to order. The program eliminates much of the marketing, shipping and financing costs typically associated with inventorying boats at a dealership. It also allows boaters to choose the features and equipment they want, and eliminates the dealer&apos;s risk of stocking a boat that may not be equipped properly for a fast retail sale, says Stenger. Given the cost savings, dealers are asked to take less profit on each sale. "Basically, the dealer is paid a flat fee, or commission, and we offer the boat at the preproduction price," Stenger says. The upshot for buyers is they can save as much as 30 percent off the manufacturer&apos;s suggested retail price. Take the 52, for example, which has a base MSRP of around $1.2 million. Stenger says the company offers the boat under the preproduction program at a base price of about $825,000 - a $400,000 savings. For dealers like Jim Shaney, who owns Great Oak Marina in St. James, N.Y., the program means he isn&apos;t limited to selling just the boats he stocks. "I used to inventory everything from the 44 down to the 19," he says. Now, because of the limited availability of floorplan credit, he has to stock fewer models. "With this program, if I have a buyer for a boat I don&apos;t stock, I have a place to show it," he says. Kuck is quick to point out the program is not an attempt to circumvent the dealer or launch a factory- direct program. "We&apos;re not a replacement for the dealer, but an addition," he says. 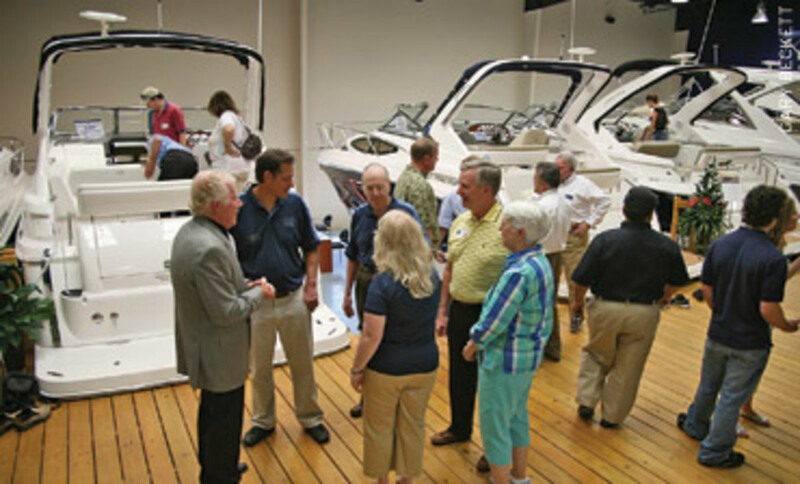 It remains to be seen whether this program is part of a permanent shift in how boatbuilders take their products to market or simply a temporary fix to a short-term dynamic - tight floorplan credit and dealer reluctance to stock inventory. For now, anyway, it appears to be addressing that dynamic in a way Regal dealers largely support.